Polaris has lined up an extensive and impressive display of 2018 models for the LAMMA show. Starting with the world’s best selling Sportsman ATVs, there are few if any to match the off-road abilities these Polaris machines have to offer. Take the Sportsman 570 EPS. It boasts 44hp, Electronic Power Steering (EPS) and Engine Braking System (EBS) to complement the class leading suspension, and true, on demand All-Wheel Drive. A long-time favourite on the farm, the Sportsman is thoroughly at home negotiating the toughest terrain while providing the rider with an ergonomic, all-round work horse. If you want an ATV that will carry two people, the Sportsman X2 570 EPS is the ideal choice, offering the features of the single-seater with the addition of Polaris 4 wheel Active Descent Control (ADC) for safely traversing the steepest hills in all types of weather. It’s the ideal solution for getting two people who need to work together into and out of the most inaccessible areas and safely down the steepest inclines, with optimum traction and control in all conditions. For those of you looking for more power from your ATV, consider the Polaris Sportsman XP 1000 with its 952cc Prostar engine producing 90hp at 7,250 rpm. That is a massive amount of power in a quad and this Polaris has a 261kg payload capacity while featuring EPS, EBS and ADC. 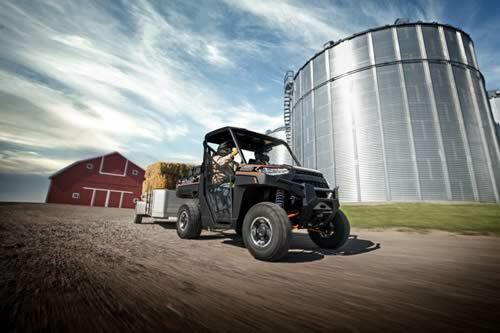 It also shares with the rest of the Sportsman range the facility for masses of storage space, with Polaris Lock & Ride, and a comprehensive choice of accessories. The Polaris Ranger has been largely responsible for leading the charge in the rapid development of the side by side utility 4×4 vehicle market in the UK. For the farmer, the Ranger offers the perfect solution in off-road working transport capable of carrying up to six people, from the two-seater Ranger 570 to the Ranger Crew XP 1000 which accommodates six people, and in addition offers a load carrying dump box at the rear. Most importantly, the Polaris Ranger series gives you the choice of petrol, diesel or electric power, with the multiple options of Lock & Ride cabs to keep out the weather and a host of accessories to meet every need on the farm. As a highly capable alternative to an ATV, the Ranger 570 will take two people comfortably where they need to be across the roughest ground in all weathers. The electric Ranger, the EV, is equally proficient in rough terrain as an eco-friendly alternative, with its silent running 30hp on demand all-wheel drive. For power, versatility and diesel economy nothing compares to the Polaris Ranger XP 1000 Diesel, sharing EPS, EBS and ADC with its Sportsman cousins and carrying three people in comfort. There’s a petrol equivalent in the Ranger XP 1000 EPS with the same features. Where there is a need to carry up to six people with room for equipment the Ranger Crew XP 1000 EPS fits perfectly as its name implies and with gamekeeping and shooting it has long become the first choice. For added convenience the six seater crew models are available in both petrol and diesel fuel option. Also on display at LAMMA, the Polaris General 1000 EPS Deluxe Tractor, with ABS (Antilock Braking System) is the ultimate side by side for farm, work, hunting and leisure. Seen alongside its bigger brothers, Polaris is featuring the Sportsman 110 which offers a great way for youngsters to get started in quad biking.